It’s no secret that Jordan Howard struggled in 2018. DBB’s Andrew Dannehy detailed those struggles in a column a few weeks ago. Despite getting 250 carries – 6th most in the NFL – he didn’t reach 1,000 yards thanks to a dismal 3.7 yards/attempt, the 4th worst average of the 23 running backs who averaged at least 10 carries per game. And lest we be tempted to blame this on Chicago’s offensive line, it’s worth pointing out that the Bears were 5th in total yards gained before contact and 9th in yards/carry before contact, per ESPN’s NFL Matchup. Tarik Cohen, who ran behind the same offensive line, averaged close to a full yard per carry more than Howard (4.5 vs. 3.7). 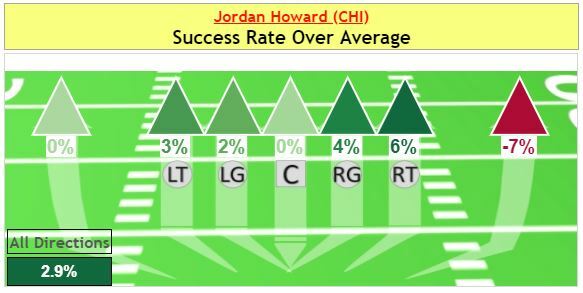 So I don’t think it’s fair to blame Chicago’s offensive line for Howard’s struggles. It is worth noting that Howard averaged only 1 yard before contact this year, one of the lowest marks in the league (PFF). Tarik Cohen averaged 2.3 yards before contact, one of the better marks in the NFL. So I think that stat says more about Howard (and how he was used) than the offensive line. This is a useful metric because it accounts for down and distance situations. A 2 yard run on 3rd and 1 hurts your rushing average but is actually a good play. And when we look at success rates, Howard actually fared quite well. Sharp Football tracks success rates for all running backs to different areas of the field, so he can compare how well one runner did compared to the league average. Howard’s chart is shown below. Here we can see that Howard was successful at least as often as the league average to every zone but outside right. Overall, he had a successful run 2.9% more often than league average when you account for where he ran the ball. Based on this, you might think Howard had a good season. In fact, his success rate is better than he posted in 2017 (-2.3%) or even his outstanding rookie campaign (+2.2%). So what gives with Howard’s bad yards per carry? The problem with success rate as a metric is that it’s binary. Every play is either a success or failure, and all successes (or failures) count the same. A 4-yard run on 1st and 10 is just as good as a 60 yarder in that both are a success, but that doesn’t reflect the reality of how valuable each run would be to an offense. So Howard had a high success rate because he did a solid job of picking up yardage to stay ahead of the chains, but his low yards per carry suggests that he did not break off enough big runs. Of the 46 running backs with at least 100 carries, Howard ranked 41st in the rate of runs that gained at least 10 yards, and 28th in runs gaining at least 20. Tarik Cohen finished with 99 carries, 1 short of being included here, but he would have ranked 16th in the rate of 10+ yard gains and 1st in 20+ yarders. This continues a trend through three seasons for Howard. As a rookie, 17% of his runs went for 10+ yards. In 2017, that dropped to 11% (around average), and in 2018 around 7%. Howard did seem to experience a bit of a late-season renaissance, possibly driven by getting more zone runs, but even then his explosive play percentage remained low. Five of his 72 carries in the last 4 games went for 10 or more yards, a rate of 6.9%, which was actually slightly worse than his season-long average of 7.3% and would have ranked 41st of 46 qualified backs. Two of those 72 carries went for 20+ yards, a rate of 2.8%, which would have ranked 25th of 46 running backs and been just below the average of those backs at 2.9%. After an explosive rookie season, Howard has declined over the last two years, to the point where he is now one of the worst running backs in the league at making big plays. He’ll still pick up decent yardage at a solid clip, but doesn’t get big plays on the ground and isn’t involved in the passing game. We have a description for runners like that: short yardage specialists. Jordan Howard simply isn’t a lead running back anymore. Stay tuned for a follow-up article (posting Monday) where I look at how Chicago’s offense as a whole did producing explosive plays in 2018, and how much this matters for overall offensive success.